A strong pressure gradient has set up in the upper Midwest as the strong Arctic high pressure center has moved into Kansas and along the front range of the Rocky Mountains. The strong westerly wind that developed on the north side of that high has brought in some milder air into the region. The temperatures rose overnight as that warmer air on the north side of the high moved in with a stiff west wind. 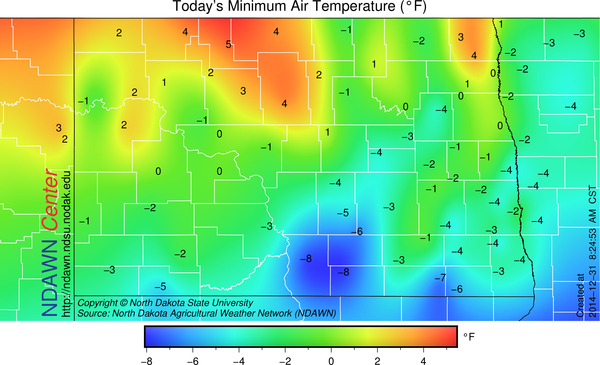 Low temperatures today for the most part occurred right at midnight with temperatures continuing to rise thereafter. 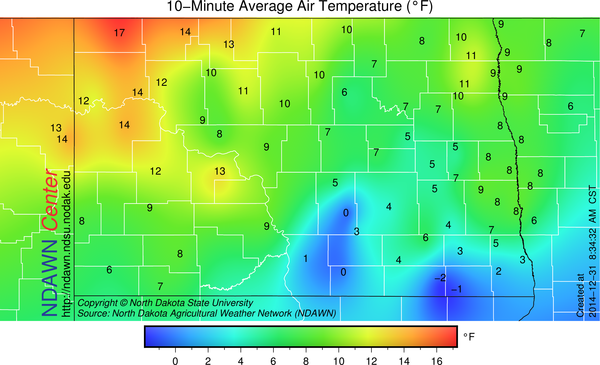 Temperatures as of 8:30 AM were already in the 10s in northwestern North Dakota with single digits elsewhere. Temperatures should climb another 10 to 15 degrees for afternoon maximums and then not really drop all that much tonight. 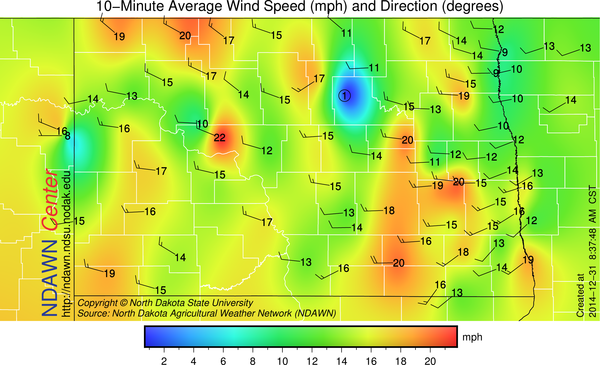 The wind has been blowing in the 15 to 25 mph range with some higher gusts. This should be the case the entire day. 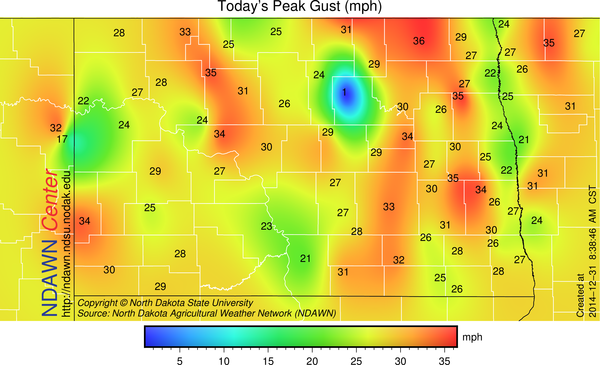 Wind Speed as of 8:30 this morning. The day is expected to be dry, outside of some flurry activity associated with some cloudiness that will be present, but tonight, a bit more than just flurries may fall in many locations across North Dakota. Later tonight an upper air disturbance will pass across North Dakota into northern Minnesota that will drop a dusting (1″ or less) of snow. 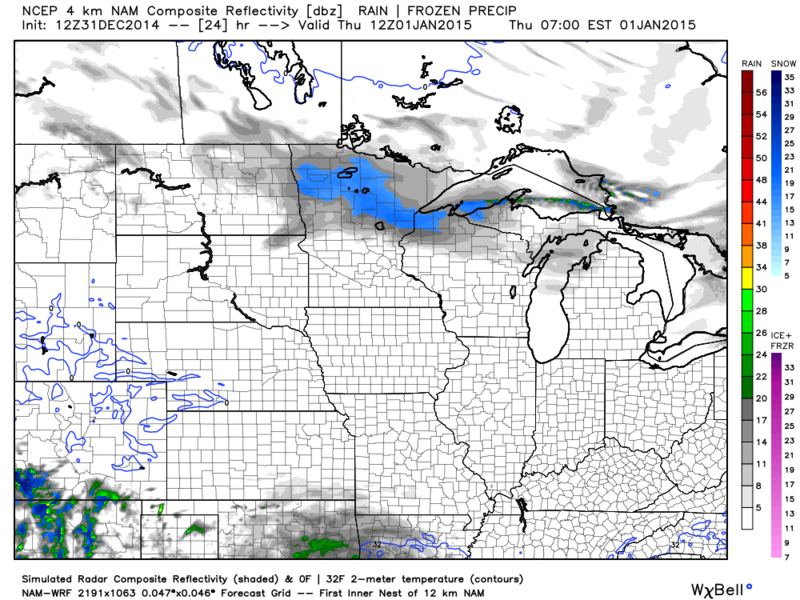 Most of the accumulating snow looks to be after midnight and ending by mid morning on New Year’s Day. With the clouds and the warmer air already in place, temperatures tonight should hold fairly steady then fall off after the snow ends tomorrow. 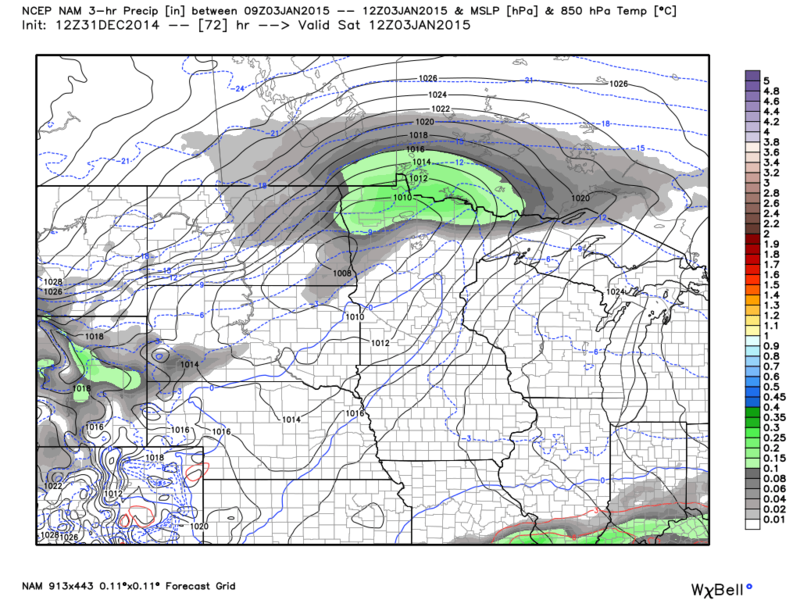 Meaning western North Dakota will record the colder air first and the Red River Valley area the latest. Therefore, morning highs are expected in the 15° to 25° range, with temperatures falling a bit during the day with a brisk northwesterly wind. A much stronger disturbance is expected on Friday Night into Saturday morning. The track of the low at the moment is expected near Interstate 94, meaning it will be along and north of Highway 200 where most of the snow will fall with the heaviest near and north of Highway 2. Near and north of Highway 2 seems at the moment to have the best potential for recording a narrow band of 3 to 5 inches of snow will an inch or less for many locations south of I-94. Much colder air is expected behind this system and Saturday, like tomorrow could easily record falling temperatures during the afternoon hours as that cold air filters into the region. With more snow cover on the ground, much colder air is expected on Sunday and Monday mornings with some -20s potential, especially in the northern tier of counties in North Dakota and northern Minnesota where the higher snow totals are currently anticipated. Although it will be a bit warmer today, the first half of January 2015 is expected to finish with below average temperatures.